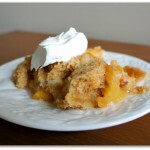 The easiest peach cobbler you will ever make! Place sliced peaches in bottom of slow cooker. In a medium bowl, combine the cake mix (unprepared) with the butter. Cut the butter into the cake mix with a pastry blender (or fork or potato masher) until crumbly. Sprinkle cake mix mixture over peaches. Place paper towel or dish towel on top of slow cooker and seal with slow cooker’s lid. Cook on HIGH for 2-3 hours or on LOW for about 4 hours. I used my 3 quart oval slow cooker for this recipe. I would also suggest using a 3 quart casserole crock slow cooker.